I would like to know how to search for pictures in windows XP in Sony notebook. Can you explain the steps involved in this? 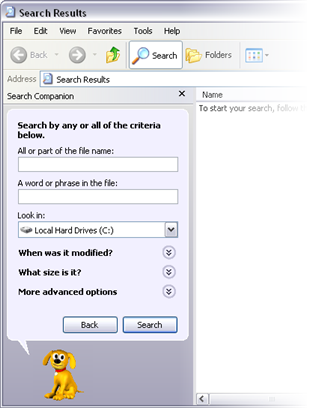 Perform the steps below to search for pictures in windows XP in Sony notebook. -Now go to the search option. -here select pictures option in the check box. -Select form which drive you wants to search the pictures in the advanced option. Now it will show all the pictures you wants to search . Its very easy to to search for pictures in windows XP. Go to the drive where you've saved the picture-you can go to any random drive. Click on the Search option above the address bar. A new search option will come with a picture of a dog in the left pane. Now enter any search string & click on Search option to start the search. Wait until it finish its work & then click on the result found to open the picture.